When visiting Greece this last season every household had rows and rows of cabbage growing in their backyard gardens. This fall dinner brings warmth to the table and is definitely considered a Greek comfort food. The stuffing can be made from beef or lamb, just substitute with the same amount. I like to serve this dish with avgholemono sauce, an egg and lemon sauce. 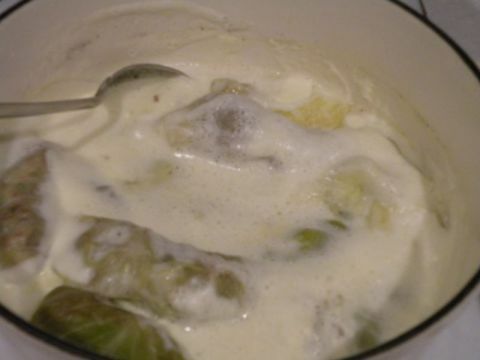 It also can be served plain with the remaining juices from the pan. A dollop of sour cream is extra, just our little addition! 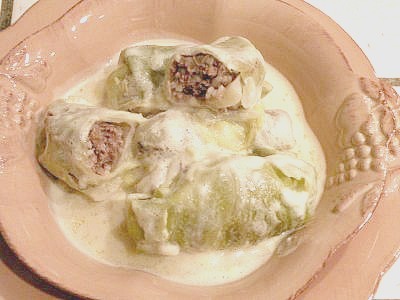 Greek Stuffed Cabbage Rolls - "Lahano Dolmathes"
Traditionally served in the winter when cabbage is available in the garden. Can be made with quinoa, bulgar, or coucous for a vegetarian meal. Place a large pot on to boil. Cut the core out from the center of the cabbage. Carefully drop the whole cabbage into the water. Boil for 10 minutes. Remove from the water and allow to cool for a few minutes. Reserve the cabbage water for later. Peel the leaves carefully, so they do not tear. Mix the ingredients for the filling. Place a tablespoon of filling on each leaf near the end of the stem. Roll tightly like a cigar. See Cooking Techniques for how to instruction. Pack rolls tightly in the bottom of a dutch oven pan. Place a small plate on top. 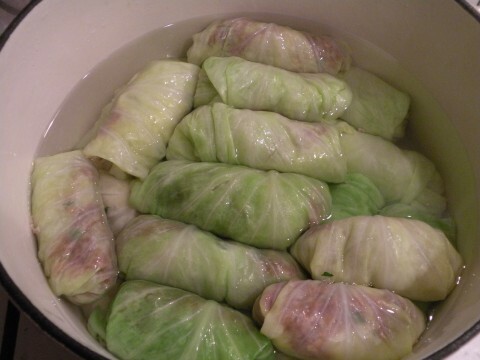 Pour 3 cups of the reserved cabbage water to the pot. Cover and bring to a boil. Beat eggs in blender or mixer, or food processor until thick and light in color. Add lemon juice slowly, then slowly add broth. Take pot off the heat, then add the lemon sauce to the pot. For a finishing sauce you can add the egg and lemon sauce! For more photos and instructions on the Cabbage Cooking Techniques. Yes, just freeze them before baking without the broth or water, just select a pot you can freeze them in , it’s easier that way. Just take them out add the broth or water, and cook a liitle longer if frozen. Then add the egg-lemon sauce or serve just with the broth.